How did we get to week 12 without featuring Youngie? Jack Young rode for Monarchs for three years, and created a record which can surely never be beaten. A star in his first UK season in 1949, he stepped up a gear in each of the following two seasons, becoming the sport's most talked-about rider by 1951. He was virtually unbeatable in Monarchs' colours, and rode regularly on Division One tracks in Test matches and special second half appearances. He had qualified for his first World Final in 1950 (top qualifier), and made it again with ease in 1951. This was a remarkable final because fellow Aussie Jack Biggs needed just one point in his last ride to take the title, but he didn't get it and set up a 3-man runoff against Youngie and Split Waterman. Biggs made the gate, Young passed him and became champion - the only second division rider ever to do it or ever likely to. Young moved to West Ham for £3,750 the following year, retained his title and is certainly one of the ten greatest riders ever. 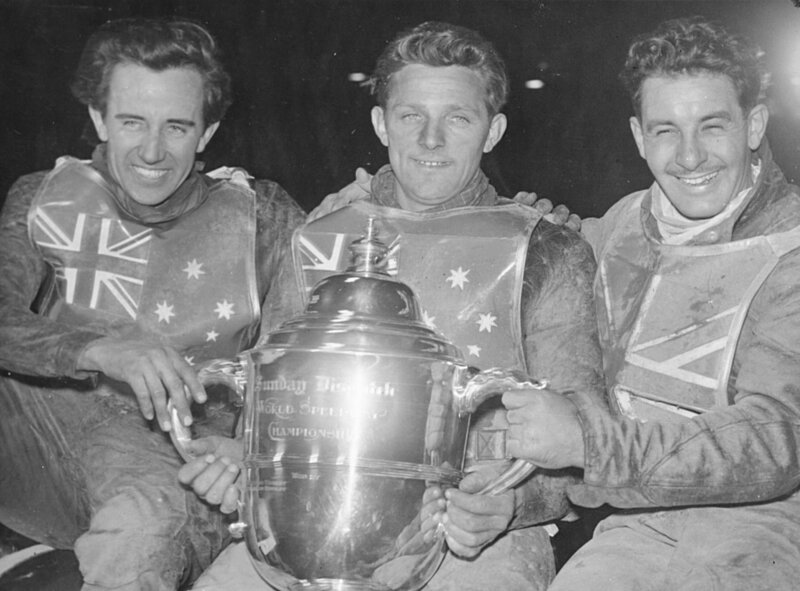 The pictures shows the 1951 champion with Biggs on the left (still smiling) and Waterman on the right.